A last minute goal from Alex Bennett secured a hard-fought 2-1 win against Hatfield Town last Wednesday. In the opening minutes Hatfield went close when Richard Cooke headed Andrew Simmons’ free kick wide. Crawley replied as Liam Toomey set up JJ Billy to score, only to see the goal ruled out for offside. Toomey then had a cross saved by Ryan Pearman, while Craig Savage had to go off injured. Billy saw his effort tipped behind by Pearman as he then missed a glorious chance when it seemed easier to score. Toomy was denied by a fine one-handed save, before the hosts went in front on 25 minutes when Sam Peverall’s corner fell to Henry Mungwira as he fired home. Hatfield levelled on the stroke of half time through Cooke’s header. After the break, Mungwira and Bennett went close, while Liam McGovern set up Mark Smith but he shot into the side-netting. Peverall’s free kick was deflected for a corner and in the last minute of normal time, it was his set-piece that set up the winner, birthday boy Bennett bundling the ball over the line. 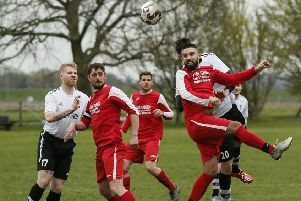 The result saw Green extend their lead at the top of the table to five points over Edgware Town. Crawley are without a game this weekend as they are next in action when then host local rivals Ampthill Town on Wednesday, December 23. >> Barton Rovers’ match against Fleet Town was postponed on Saturday. They were at home to St Ives Town last night and host Bedford on Satuday.